Try now – it's free! If an email can’t be delivered to an email address at all, it’s called a bounce. This might happen for different reasons, for example the email address you introduced doesn’t exist anymore or the mailbox is full. There are two kinds of bounces you can expect: soft and hard bounces. The former means that the email address is well valid and the email message reached the recipient’s mail server. However, the email bounced back because the mailbox was full at the time. A hard bounce, however, is an email that can’t be delivered for permanent reasons. You might have introduced a fake address. Alternatively, the email domain might not be on a real domain. Moreover, the email recipient’s server might not accept emails. There are numerous reasons for a hard bounce. If you use conventional email servers to send newsletters, you’ll probably notice that bounce will become an issue. After each shipment, bounces will accumulate in your inbox. Going through the emails and removing invalid email addresses is a time-consuming chore. Moreover, it might prove impossible to deal with it manually. Furthermore, it would be difficult to distinguish between soft and hard bounces. Now you can see how difficult it is to manage newsletter bounces by yourself. If you use an email marketing tool, it will take automatically take care of bounce management. Going for an email marketing solution saves a lot of manual work and gives you a comprehensive overview. If you use Newsletter2Go, expect automatic email bounce management. 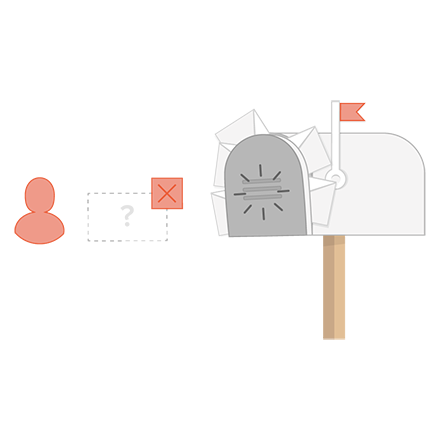 You won’t receive any mail delivery system failure messages as the system will react automatically to them. Depending on the bounce type, the email address is either blocked immediately (if it’s a hard bounce) or after three failed email delivery attempts. Another advantage of automatic bounce management for newsletters is the fact that bounces are marked in your contact list(s) so that they aren’t contacted ever again. Once you go to the newsletter reports section, you will be able to learn more about the bounces. Here you can see what the bounce rate is and see affected email addresses. Naturally, the report distinguishes between soft and hard bounces so you can see for yourself what was the bounce cause. If you feel it’s high time to trim your email list, you are free to export or delete the bounces. In order to do so, simply select all bounces. Even if you re-import contacts who have already been registered as a bounce, they remain inactive. Thanks to newsletter bounce management, incorrect addresses won’t be contacted anymore and you will enjoy a low bounce rate. Automatic bounce management for newsletters is at the core of successful email marketing. Thanks to it you can easily manage your reputation. The bounce rate impacts sender’s reputation. It is worth to note that a high bounce rate can land your email on a blacklist. It so happens because a high bounce rate may indicate you’re sending unsolicited email. This post will show you why you don’t want to manage newsletter bounces by yourself. Therefore, you should let the software to deal with email newsletter bounces.